Astronomers report a baffling discovery never seen before: An extraordinary amount of dust around a nearby star has mysteriously disappeared. "It's like the classic magician's trick -- now you see it, now you don't," said Carl Melis, a postdoctoral scholar at UC San Diego and lead author of the research. "Only in this case, we're talking about enough dust to fill an inner solar system, and it really is gone!" "It's as if the rings around Saturn had disappeared," said co-author Benjamin Zuckerman, a UCLA professor of physics and astronomy. "This is even more shocking because the dusty disc of rocky debris was bigger and much more massive than Saturn's rings. The disc around this star, if it were in our solar system, would have extended from the sun halfway out to Earth, near the orbit of Mercury." The research on this cosmic vanishing act, which occurred around a star some 450 light years from Earth, in the direction of the constellation Centaurus, appears July 5 in the journal Nature. "A perplexing thing about this discovery is that we don't have a satisfactory explanation to address what happened around this star," said Melis, a former UCLA astronomy graduate student. "The disappearing act appears to be independent of the star itself, as there is no evidence to suggest that the star zapped the dust with some sort of mega-flare or any other violent event." Melis describes the star, designated TYC 8241 2652, as a "young analog of our sun" that only a few years ago displayed all of the characteristics of "hosting a solar system in the making," before transforming completely. Now, very little of the warm, dusty material thought to originate from collisions of rocky planets is apparent. "Nothing like this has ever been seen in the many hundreds of stars that astronomers have studied for dust rings," Zuckerman said. "This disappearance is remarkably fast, even on a human time scale, much less an astronomical scale. The dust disappearance at TYC 8241 2652 was so bizarre and so quick, initially I figured that our observations must simply be wrong in some strange way." Norm Murray, director of the Canadian Institute for Theoretical Astrophysics, who was not part of the research group, said, "The history of astronomy has shown that events that are not predicted and hard to explain can be game-changers." The dust had been present around the star since at least 1983 (no one had observed the star in the infrared before then), and it continued to glow brightly in the infrared for 25 years. In 2009, it started to dim. By 2010, the dust emission was gone; the astronomers observed the star twice that year from the Gemini Observatory in Chile, six months apart. An infrared image obtained by the Gemini telescope as recently as May 1 of this year confirmed that the warm dust has now been gone for two-and-a-half years. Like Earth, warm dust absorbs the energy of sunlight and re-radiates that heat energy as infrared radiation. Because so much dust had been orbiting around the star, planets very likely are forming there, said Zuckerman, whose research is funded by NASA. The lack of an existing model for what is going on around this star is forcing astronomers to rethink what happens within young solar systems in the making. The dust likely resulted from a violent collision -- but that would not explain where it went. Was it somehow swallowed by the star? "Although we've identified a couple of mechanisms that are potentially viable, none are really compelling," Melis said. "In one case, gas produced in the impact that released the dust helps to quickly drag the dust particles into the star and thus to their doom. In another possibility, collisions of large rocks left over from an original major impact provide a fresh infusion of dust particles into the disc, which then instigate a runaway process where small grains chip into oblivion both themselves and also larger grains." 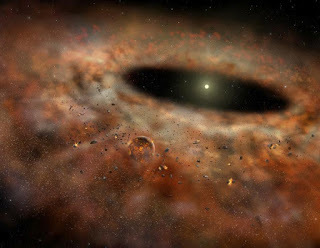 Major dusty regions are known to exist in our own solar system and include the asteroid belt between the orbits of Mars and Jupiter and another located beyond the orbit of Neptune. Nearly 30 years ago, NASA's Infrared Astronomical Satellite (IRAS) first discovered many similar regions orbiting other stars -- but no disappearing act like the one at TYC 8241 2652 has ever been seen during these three decades. The research is based on multiple sets of observations of TYC 8241 2652 obtained with the Thermal-Region Camera Spectrograph on the Gemini South telescope in Chile, the IRAS, NASA's Wide-field Infrared Survey Explorer (WISE) satellite, NASA's Infrared Telescope on Mauna Kea in Hawaii, the Herschel Space Telescope of the European Space Agency (ESA), and AKARI (a Japanese/ESA infrared satellite). "We were lucky to catch this disappearing act," Zuckerman said. "Such events could be relatively common, without our knowing it." Co-authors of the Nature paper are Joseph Rhee, a former UCLA postdoctoral scholar in astronomy, who is now an astronomer at California State Polytechnic University in Pomona; Inseok Song, an assistant professor of physics and astronomy at the University of Georgia who also was a postdoctoral researcher at UCLA; and astronomers Simon Murphy and Michael Bessell at the Australian National University.